A blood feud. A pursuit. Vampires. Vampire Veronica Melbourne hunts down evil vampires and rogue supernaturals. She also hunts humans—if they give her a reason to kill. This time, she’s hunting an enemy she’s never seen before. When Ida Averbach, a mysterious Russian, hooks up with the Van Burens, a couple on vacation, their night of three-way pleasure leads to a blinding flash, a blackout and Walker waking up to Chelsea’s corpse. Miss Averbach is nowhere to be found and Walker’s wife’s body is ripped apart when something frightening emerges from it. Even worse, Walker is intimate with it—it turns out this was a bad idea. While investigating the scene of the crime, vampire Veronica Melbourne hides Chelsea’s body in the woods and takes Walker Van Buren away with her. Veronica and Walker meet up with Rand, her lover and a vampire hunter. Rand guards Walker while Veronica goes on a mysterious errand. When she returns, Veronica takes Walker to Julia, who also has no clue what sort of supernatural evil they’re fighting. When Veronica finally learns what she is up against, she enlists the help of a witch. Information is power. But information can also be deadly and now, Veronica knows too much. Can Veronica find, battle and overcome the most evil thing to ever spring out of a corpse without getting herself—and everyone she cares for—killed? 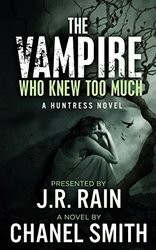 THE VAMPIRE WHO KNEW TOO MUCH is a paranormal adventure thriller of good versus evil, paranormal battles, and terrifying preternatural creatures.